Most people who make the trek to the National Shrine of the Cross in the Woods come to admire the world’s second tallest crucifix. 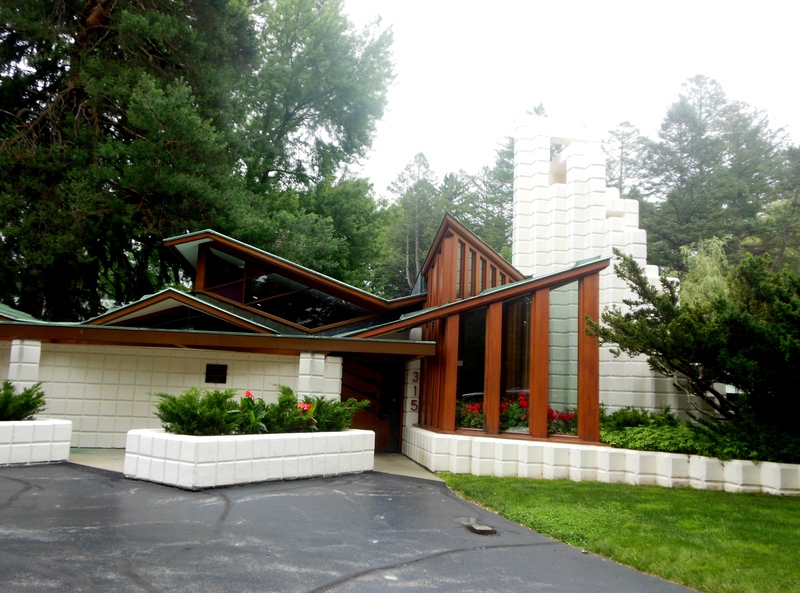 I, however, was on a quest to see the church that architect Alden B. Dow (1904-1983) designed in 1949. As I entered the simple space inspired by a Native American long house, my eyes went straight to the light fixtures hanging from the ceiling. Even without providing illumination, they were striking works of art. It was then that I realized that a talented architect was at work here, making a utilitarian object beautiful by using the power of light to evoke the mood. 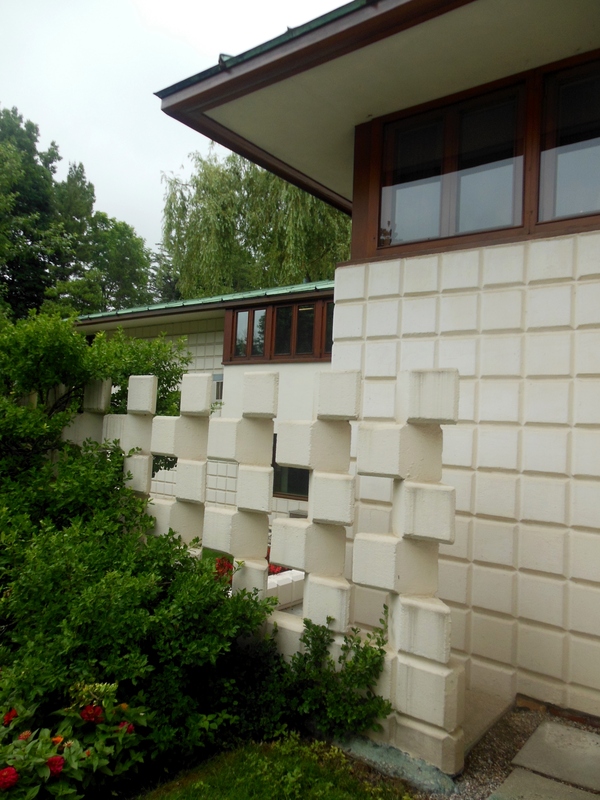 And I couldn’t wait to experience what is considered to be the crown jewel of his work — his home and studio in Midland, Michigan. Dow’s father, Herbert, founded The Dow Chemical Company in 1897, making Midland an industrial mecca where chloroform, aspirin, Epsom salts, indigo dye and other life-changing products were developed. But Alden made Midland a showplace of modern architecture, designing over 100 buildings there that were intended for living, worshiping, working, learning, governing and enjoying leisure time. During a career in which he designed more than 600 structures, Dow approached his work with honesty, humility and enthusiasm, finding inspiration in nature, the Japanese aesthetic, color, and even play. What resulted were stylish, efficient and very liveable structures. 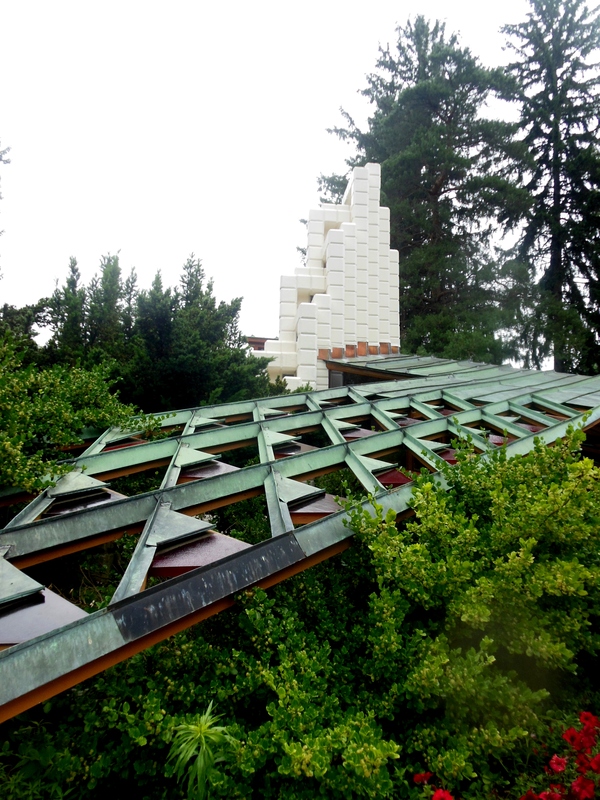 The first two decades of his career reflected the influence of Frank Lloyd Wright and his organic approach to architecture; Dow worked at Taliesin in the summer of 1933. Later, his work reflected “composed order,” taking creative, original approaches to practical matters like the building site and the owner’s budget, needs and personalities. Every imaginative detail of Dow’s work was decided upon with great care. His Unit Blocks, which he patented in 1936, were used to build various structures with interesting textures and patterns. Made from cement and cinder ash residue from the Dow Chemical Company’s coal furnaces, these one-foot-square beveled blocks had 45-degree angled sides, and were painted white. Seen from the front, each block appears to be a square; when seen from above, it resembles a parallelogram. Both structurally sound and decorative, they could be paired and stacked into columns to form covered arcades, planters, and even steplike chimney structures for climbing. All of Dow’s principles combine in one tremendous composition: His home and studio. Dow began designing his studio in 1933; it was completed in 1937. His home followed, from 1939 to 1941. The complex was sited on part of his father’s property. The end result is extraordinary. You can tell that just by looking at the front gate. 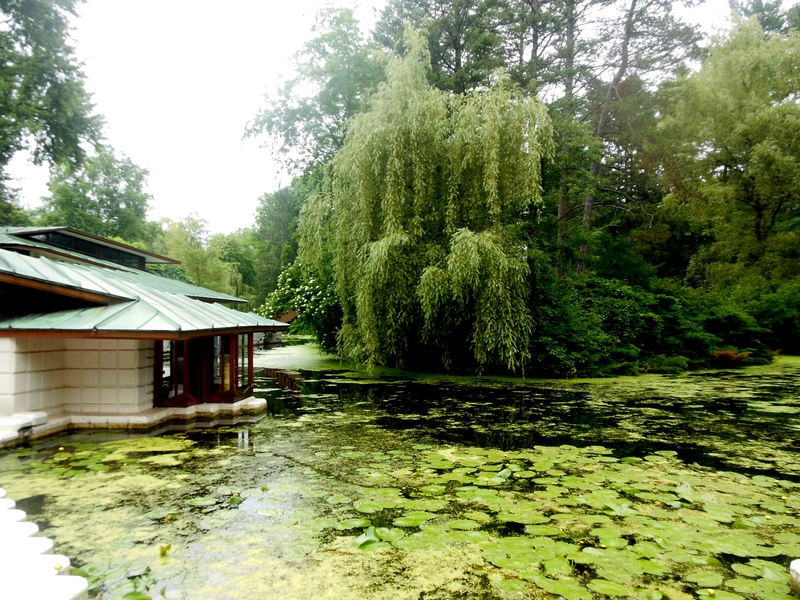 A stream on the property was diverted to create a reflecting pond, in which the building was sited. It seems to glide through the water like an ocean liner. The structure is defined by parallelograms, triangles and Unit Blocks, from sawtooth projections on the copper roof to red glass triangles inset in windows and doors. Dow’s studio resembles a railroad car. Lit by a long row of four-foot-square casement windows, one drafting room accommodates five drafting tables, work stations and storage cabinets. Another is sunken to follow the contours of the surrounding sloping land. steps lead down into a raspberry-and-moss green sitting area accented with white Unit Block walls, red upholstered chairs and red cypress furniture. The conference room, known as the Submarine Room, has a floor that is sunk 18 inches below the surface of the surrounding pond, so seated visitors are at eye level with the surface of the water. The windows are hidden under a seamed copper, angled roofline that is only five feet high. “Fun can be found almost everywhere,” Dow said. That’s true just about everywhere you look in this extraordinary place. 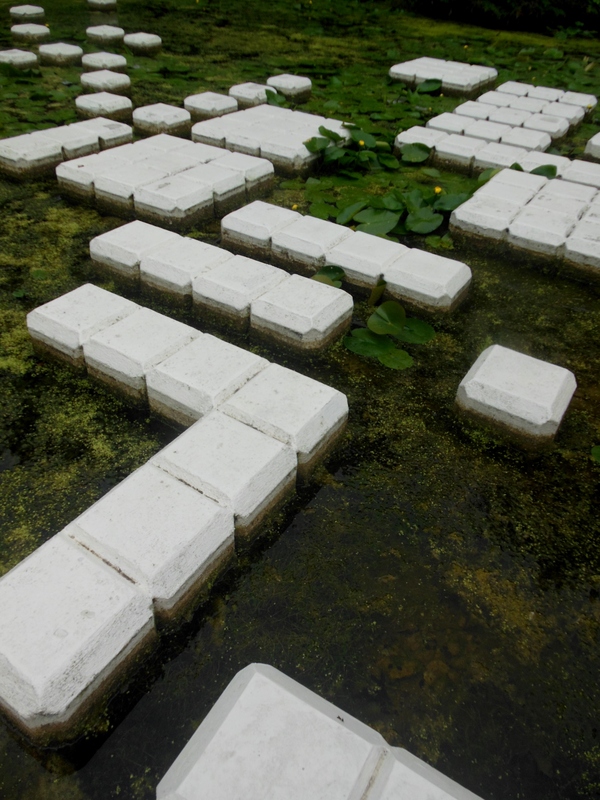 He put Unit Blocks in the pond, some just under the surface, like stepping-stones, for his children and his guests alike to test their agility. He originally fitted the living room’s cathedral ceiling with strips of Dow Chemical’s Ethocel plastic; hidden fluorescent lighting made the ceiling glow like the moon at night. The Dow children could dangle their legs through a wooden latticework trellis on the ceiling of Mrs. Dow’s library. In the family’s game room, he placed votive candles in blank spaces between Unit Blocks to light the space. Trains travel throughout the house on a plywood track, journeying through tunnels in the master bedroom, sitting rooms, Dow’s office and the playroom, which now houses the Alden B. Dow Archives. The playroom was once filled with all manner of toys, from wind-ups and wooden horses to airplanes, and many of them are still there today. The home’s theater was a spectacular place to view Dow’s home movies. Color makes the home an extraordinary place. Fascinated by Alexander Calder mobiles, Dow created his own versions with brightly colored disks, rectangles and squares hanging in stairways, echoed in compositions in carpets. Apple green, purple, red-orange and mustard-yellow combinations complement a carpet woven in an abstract design of yellow, green, red-orange, blue, and dark purple on an off-white background. Dow designed a teak dining table, upholstered chairs with barrel-shaped arms, and many other pieces of furniture for his home and studio, all manufactured by Herman Miller, Inc. of Zeeland, Michigan. Cozy niches provide display space for pottery, mechanical toys and other decorative art objects from Dow’s collection. Dow’s creativity extended to the home’s surroundings. A porch with sheer copper mesh screens is cantilevered over the pond, providing a beautiful view of the garden. 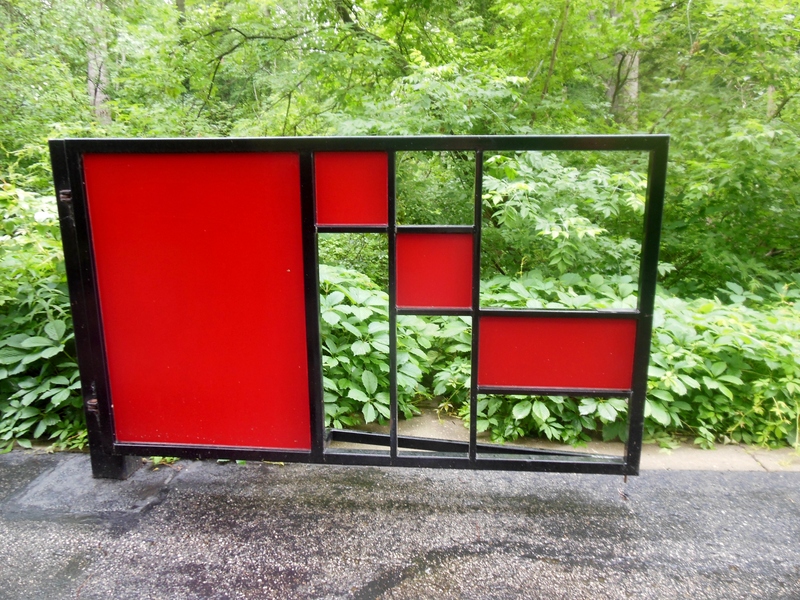 Oriental-inspired red bridges lead to his father’s magnificent gardens. 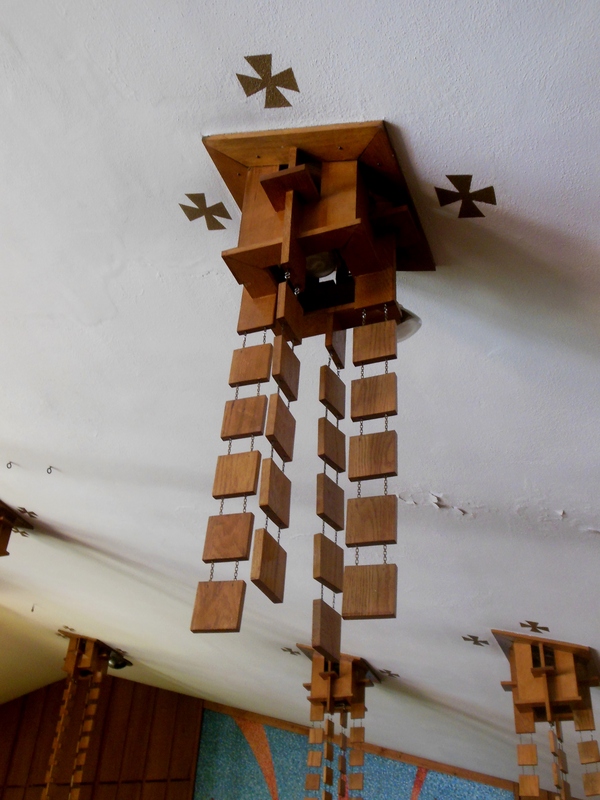 In 1962, he designed a series of abstract wooden garden lanterns, fashioned from geometric shapes. Some resemble tree trunks; others look like pagodas assembled from diamond-shaped redwood leaves. The June 1962 issue of House Beautiful included a feature on Dow’s lanterns. 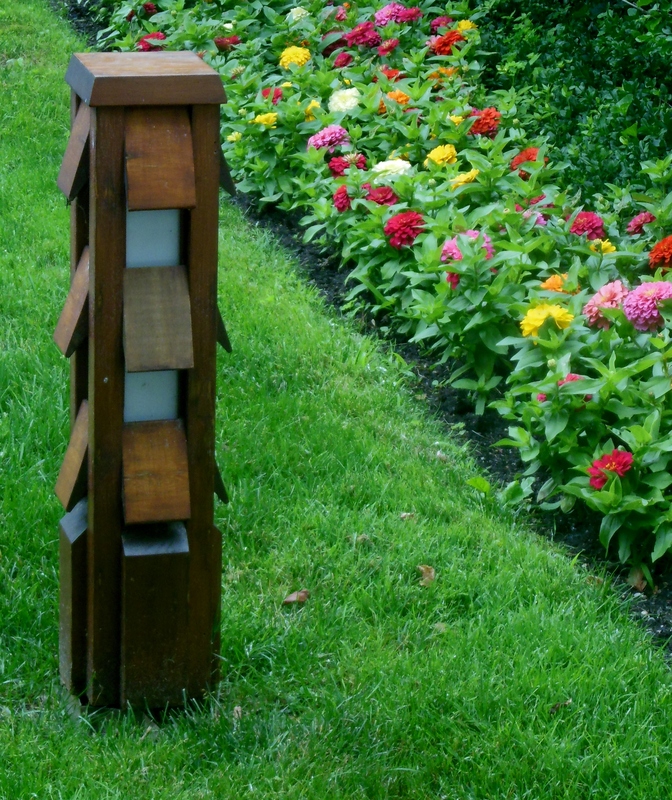 For $2, readers could send for the working drawings of six garden lights and create versions of them for their own gardens. Dow’s creativity extended beyond architecture. His passion for trains is evident. An avid motion-picture taker, Dow created “Somnophonics,” dreamy interpretations of classical piano music by modern dancers whose movements before primary-colored floodlights and translucent screens created artistic shadows. He even designed his own clothes. Vests zipped up on the side and had long lapels. Trousers lacked belts and suspenders. Nothing had buttons. For more on Alden Dow, read Alden B. Dow: Midwestern Modern, by Diane Maddex; The Architecture of Alden B. Dow and Life Imitates Architecture: Taliesin and Alden Dow’s Studio, both by Sidney K. Robinson; Composed Order: The Architecture of Alden B. Dow, edited by Robert G. Waite and Judith O’Dell; A Way of Life, from an exhibition at the Midland Center for the Arts; and Reflections, by Alden B. Dow. Also see “Garden Lights Should Do More Than Light,” in the June 1962 issue of House Beautiful, and “Alden Dow: His Modern Homes Are Not Monastic,” from the March 15, 1948 issue of Life, pages 88-92. This entry was posted in Architecture, Art, Michigan, Museums, Travel. Bookmark the permalink. What an interesting essay. So much talent in one family. Some of Alden Dow’s creations are timeless. I have visited Taliesen West and can see the resemblance in some of the works. Thanks again, T.